"Boston Bronze and Stone Speaks To Us" Salutes the one year anniversary of "Edgar Allen Poe Monument and all those who have participated in its completion. Some Secrets shared by Those who Care about this Great Boston Poet written below. A sculpture by Stefanie Rocknak "Poe Returns Home"
"One of the best-kept secrets in Boston's literary history concerns the most influential writer ever born here: Edgar Allan Poe. And the secret is this: he was born here! 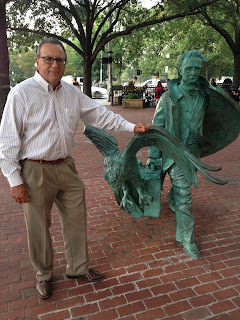 Over the past 200 years, leading up to the bicentennial of Poe's birth on January 19, 2009, his connections to other East Coast cities—Richmond, Baltimore, Philadelphia, and New York—have been celebrated and memorialized. While each of these cities hosts a museum or historic house that commemorates Poe's standing as a local author, Boston has made itself conspicuous for its apparent determination to treat the master of mystery—America's first great critic and a foundational figure in the development of popular culture—like an undeserving orphan. This attitude is all the more fascinating because it can be traced back to the antebellum period, involves a war of words as snarky as any from that time, and is based on a misunderstanding of the importance of Boston to Poe's development. It turns out that both Poe the baby and Poe the writer and critic were born in the same place. 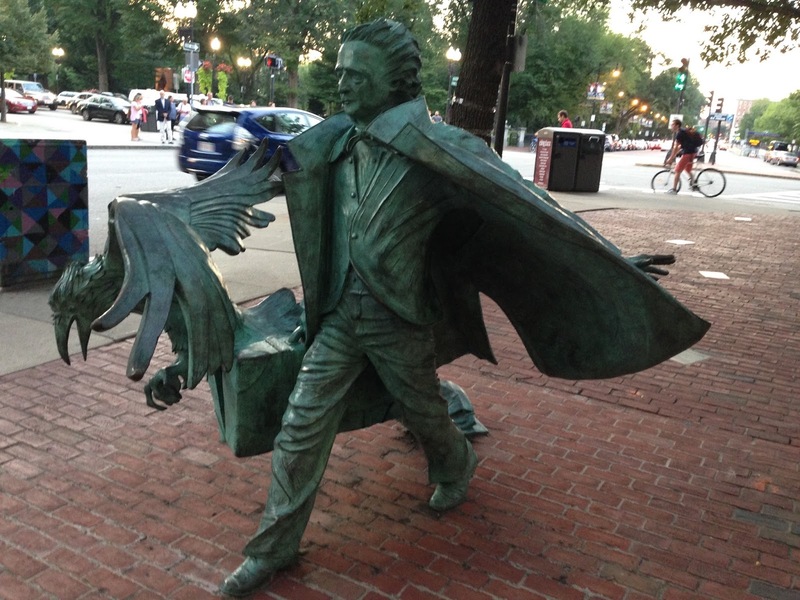 Mounted at the end of the Poe bicentennial year, THE RAVEN IN THE FROG POND uses materials from the collections of the Boston Public Library, the American Antiquarian Society, Susan Jaffe Tane, and M. Thomas Inge to tell the complex story of Poe's relation to the city of his birth. While it’s true that Poe fought a career-long battle against Boston-area authors, whose moralistic poems and stories sounded to him like the croaking of frogs, it’s also true that he had positive feelings about the place. He knew that his mother had found her best friends here. He discovered his first literary mentor, and published his first and last works here. Indeed, his decision to move here in 1827 and his determination to move back in the weeks before his unexpected death in 1849 suggest that he thought of Boston as a place of refuge and new beginnings." By Boston Public Library " Raven in The Frog Pond"
For additional information about Poe and Boston, visit the Edgar Allan Poe Foundation of Boston, Inc.
Research Team: Paul Lewis (Curator), Dan Currie (Associate Curator), Megan Grandmont, Katherine Kim, Sarah Poulette, and Rob Velella. Beth Prindle, Kimberly Reynolds, Aaron Schmidt, Karen Shafts, Stuart Walker, and Jane Winton. The Raven in the Frog Pond is sponsored by Susan Jaffe Tane, the Boston Public Library and Boston College Libraries, American Studies Program, College of Arts & Sciences, English Department, Institute of the Liberal Arts, Jesuit Institute, and Newton College Alumnae Chair in Western Culture. Graphics work by Brandon Bird Design and Rachel Gregorio, Media Technology Services, Boston College. A most beautiful flowing dynamic bronze. Filled with action determination conviction and symbolism. A true work of art speaking to us all through the genius of the artist Stefanie Rocknak.